Lately, Friday nights have gone retro – back to our early years of marriage when we used to spend Friday night date nights at home. We’d put our babies to bed, I’d cook a quick meal or we’d get takeout, and we’d watch a movie curled up together on the sofa. Date night at home has evolved. We don’t do take-out anymore and I like to create new cocktails and try out new recipes. Tonight, I recreated a favorite restaurant cocktail and made this farro dish. It has a nutty, heartiness that’s perfect for a chilly, fall night. The farro is served hot, but I think it could be just as tasty if it was served cold as a salad. Farro directions: Bring the 6 cups of water to a boil. Add the salt, garlic, bay leaf and farro. Reduce heat to medium-low and simmer uncovered for 30 minutes, until tender but al denté. Drain well, remove the garlic and bay leaf, and reserve ½ cup of the cooking liquid. Brussels sprouts directions: Heat a large non-stick skilled to medium-high heat. Add the butter. As soon as the butter is melted, add the olive oil. Stir well and add the Brussels sprouts and shallots. Sauté for about 7 minutes until golden-brown, stirring only from time to time. Add the garlic and sauté for an additional minute or two, until the garlic has released its flavor but has not browned. 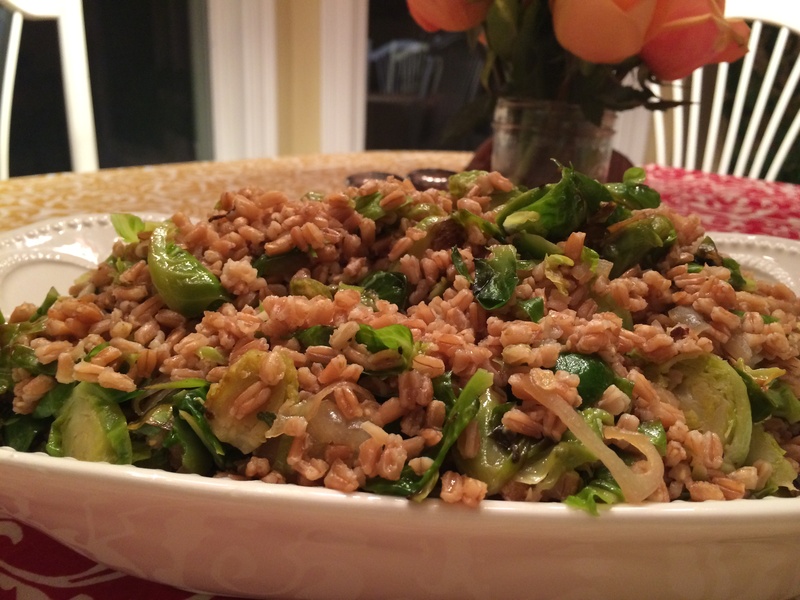 In a large serving bowl, combine the farro, Brussels sprouts, and pistachios. Season to taste. Serve as a vegetarian main dish or as a side dish.